Fiorentina striker Houssine Kharja is one of just two over-age players in Morocco's squad for the men's Olympic football tournament. The other over-age player chosen by coach Pim Verbeek is Nordine Amrabat. 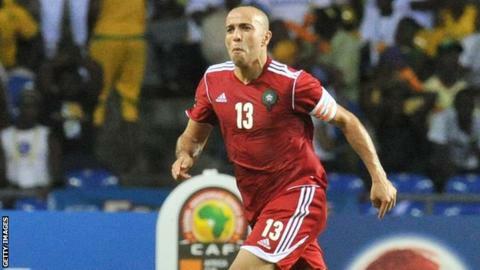 Kharja, who was Morocco captain, and Amrabat were both part of the Atlas Lions squad at the 2012 Africa Cup of Nations. However, an inkle injury has forced highly-rated Montpellier midfielder Younes Belhanda to miss the tournament. Verbeek admitted Belhanda's absence was a big blow. "He's a player we'll really miss, he's a very talented player - I think half of Europe is trying to get him," the coach told BBC Sport. "He got injured in the national team - he has played in about the last 20 international games and was injured against The Gambia in June. "He is still recovering from the injury and only had a 20 per cent chance of being able to play at the Olympics." The Dutch coach also said he had issues securing the release of his over-age players. "We only have two over-age players - the other clubs didn't want to allow their players to be part of the Olympics," he said. Belhanda played for Morocco at this year's Nations Cup, while goalkeeper Mohamed Amsif and Abdelhamid El Kaoutari - who were also part of the Nations Cup squad - have made the Olympic selection. Italy-based Omar El Kaddouri is also included in the squad following his recent nationality swap from Belgium. Volatile midfielder Adel Taarabt was overlooked by Verbeek despite being eligible as an under-23 player, meaning his English club QPR would have had to release him under Fifa regulations. Eight of the players who helped Morocco qualify for the Games, by finishing as runners-up at the inaugural African Under-23 Championship, are in the final 18-man squad for London. Morocco will be making their seventh appearance at the Olympic men's football tournament, where they open their Group D campaign against Honduras on 26 July. Three days later, they play Japan in Newcastle before a final game against Spain at Old Trafford in Manchester on 1 August. The Morocco squad will prepare in the Netherlands from next week.